REV. DENNIS A. DEVER – in Boston, March 20th at eighty-three years of age. Beloved son of the late William and Mary (Gilgun) Dever. Loving Brother of Mary E. Gorman and Marjorie Dever, brother-in-law Edward L. Smith and sister-in-law Anne Dever all of Woburn and the late, Ann Doherty, Eleanor Smith, William and John Dever. Dear uncle of twenty seven loving nieces, nephews and many great nieces and nephews. A Funeral Mass will be Celebrated, Wednesday, March 28th in St. Clement Parish Church, 71 Warner Street, Medford, at 10 a.m. Interment in Calvary Cemetery, Winchester. Family, Friends and Parishioners are respectfully invited to calling hours, TUESDAY, March 27th from 2-6 p.m. in St. Clement Parish Church. Remembrances may be made in Fr. Dever’s memory to The Missionary Society of St. James the Apostle, 24 Clark St., Boston, MA 02109 or to Regina Cleri Residence, 60 William Cardinal OConnell Way, Boston, MA 02114. Arrangements are under the direction of Lynch-Cantillon Funeral Home, 263 Main St., Woburn. For directions or to leave an online condolence, please visit www.lynch-cantillon.com or Facebook under Lynch-Cantillon Funeral Home. Rev. Fr. Dennis A. Dever, a long-time devoted Pastor of St. Clement Parish in the Medford, Somerville area, passed away peacefully, Tuesday, March 20th at Mass General Hospital, at eighty-three years of age. Born in Woburn, Father Dever was the sixth of seven children to the late William and Mary (Gilgun) Dever. A son of St. Charles Borromeo Parish, he attended the parish’s elementary school, on to Boston College High School where he graduated from in 1951. As a child and while growing up, Father Dever was spiritually drawn to the priesthood. Following high school he began his studies at Cardinal O’Connell Minor Seminary in Jamaica Plain, and then on to St. John’s Seminary in Brighton. Father Dever was ordained on Feb. 2, 1960 at the Cathedral of the Holy Cross by Cardinal Richard Cushing. Fr. Devers first assignment was at St. Joseph Parish in Quincy. After six years at St. Joseph Parish, Father Dever chose to join the Missionary Society of St. James the Apostle, an international organization of diocesan missionary priests; who volunteer to serve the Church in Peru, Bolivia and Ecuador. For the next 13 years, he served the St. James Society, first in an impoverished area of Ecuador and later as the Superior of the Society. 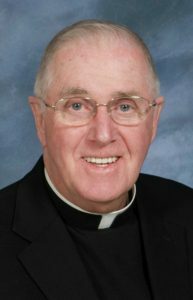 In 1979, Father Dever was made Pastor of St. Mary of the Annunciation Parish in Cambridge, where he served for six years. In 1985, as Pastor of St. Clement Parish in Medford, where he served for over 27 years, until his retirement in 2013. Fr. Den as he was affectionately called by his family, was a quiet, unassuming man with a good sense of humor. Throughout his life, he always put others before himself, especially his family. He enjoyed golfing, especially golfing trips to Florida, hockey, and visiting the beach. He will be deeply missed and touched many lives. He was the loving brother of Mary E. Gorman and Marjorie Dever, both of Woburn, and the late, Ann Doherty, Eleanor Smith, William and John Dever. Dear uncle of twenty seven loving nieces, nephews and many great nieces and nephews. A Funeral Mass will be Celebrated, Wednesday, March 28th in St. Clement Parish Church, 71 Warner Street, Medford, at 10 a.m. Interment in Calvary Cemetery, Winchester. Family, Friends and Parishioners are respectfully invited to calling hours, TUESDAY, March 27th from 2-6 p.m. in St. Clement Parish Church. Remembrances may be made in Fr. Dever’s memory to The Missionary Society of St. James the Apostle, 24 Clark St., Boston, MA 02109 or to Regina Cleri Residence, 60 William Cardinal OConnell Way, Boston, MA 02114. Arrangements are under the direction of Lynch-Cantillon Funeral Home, 263 Main St., Woburn. For directions or to leave an online condolence, please visit www.lynch-cantillon.com or Facebook under Lynch-Cantillon Funeral Home. My heartfelt condolences to the family and friends of Fr. Dever. He ministered to me at one of the most difficult times in my life and as a result, brought me back to the Church! I owe a debt of gratitude to him and to God for bringing him into my life. St. Clement’s Parish has not been the same since he retired. I will pray for his soul and for the repair of your hearts. Father Dever. We loved you when you were hereMay you now Rest In Peace. You will always be in my prayers. you in spirit and those memories of him. Rest in peace Father Dennis. I am a parishioner of St. Clement’s and I remember Father Dever as one of the kindest and most caring priests I have ever known. My condolences to his family. Dee and Charlie Breen Sr.